Daffodils are extremely popular flowering bulbs that are some of the earliest sources of color each spring. You really can’t go wrong when planting daffodil bulbs, but the sheer variety can get overwhelming. Keep reading to learn more about the different types of daffodils and how to tell them apart. 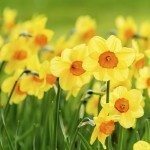 What are some different types of daffodils and how many types of daffodils are there? Including hybrids, there are over 13,000 distinct daffodil varieties in existence. Those can be divided, however, into about a dozen different types of daffodils that are characterized by the size and shape of their petals (the outer part of the flower) and their coronas (the inner petals that are often fused into a single tube). Trumpet varieties of daffodils are distinguished by a fused corona that is noticeably longer than the petals (like a trumpet). If the corona is shorter than the petals, it’s called a cup. Two varieties of daffodils are known as large-cupped and small-cupped, depending on the size compared to the petals. Double daffodils have either a double set of petals, a double corona, or both. Triandus has at least two flowers per stem. Cyclamineus has petals that flare back from the corona. Jonquilla has fragrant flowers that appear in clusters of 1 to 5 per stem. Tazetta has fragrant clusters of at least 4 and as many as 20 flowers per stem. Poeticus has one fragrant flower per stem with large white petals and a very small brightly colored corona. Bulbocodium has a very large trumpet with relatively tiny petals. Split corona has a corona that is not fused and appears as another ring of petals. Not all daffodils fall into these categories, and each category contains countless specimens and cross-category hybrids. As a rule, though, you can sort the different types of daffodils into these categories to get a better sense of what you’re looking for.